This article discusses specific plot details from Life Is Strange, Until Dawn, Oxenfree, and Night In The Woods. The rate at which popular culture refreshes itself is constantly speeding up, and youth culture refreshes itself even faster. In 2000’s Jet Set Radio, gangs of hoodlums put aside their squabbles to unite against a villainous corporate stooge, but just eight years later, in The World Ends With You, a new generation of teens were instead at each others’ throats in a fashion-show blood sport. Those games illustrated a shift away from unified rebellion against authority and toward a morass of bullying and insecurity. But in retrospect, for all their differences, they had something important in common—they depicted worlds in which young adults’ antagonists could be identified and defeated. It’s been almost 10 years since The World Ends With You, and a new crop of youth culture games are claiming those days are over. 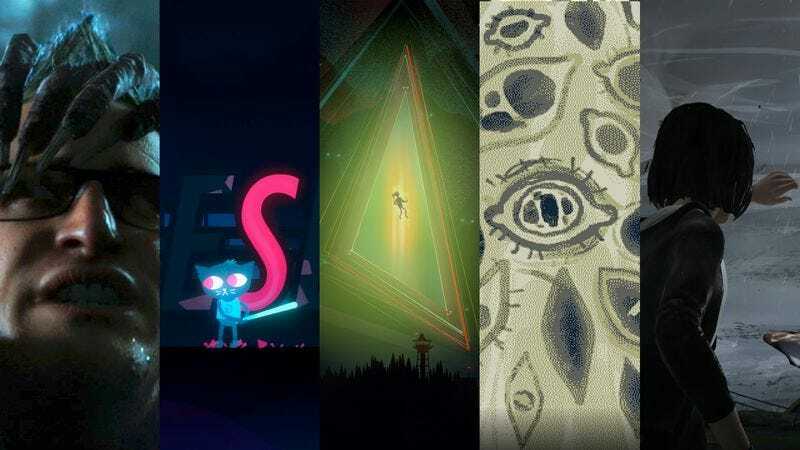 There’s a recent wave of young-adult games that stretches from the Square Enix-published Life Is Strange and the Hollywood-aping Until Dawn all the way down to indie darlings like the summer-camp gothic We Know The Devil and ghost story Oxenfree. While these titles are wildly disparate in their scope and style, they have enough in common in their tone and themes to be considered a bona fide movement. Their young protagonists are usually isolated from society, and any adults that are present are either unhelpful or threatening. They all contain pronounced horror elements, some presenting them up front while others only spring them once players are invested in their world and characters. Most tellingly, they’re all stories in which the biggest threat comes not from some specific character, but from massive, unknowable, borderline abstract forces. For today’s young heroes, the real threat is neither adults nor fellow kids but an incomprehensible world hellbent on punishing them with a harshness disproportionate to their crimes, or for crimes they didn’t even commit, or sometimes for no reason at all. It’s a punishment that can’t be delayed, contested, or fought against, only endured. Every entry in this new canon manifests this vindictive, pitiless force differently—as a monster, or a storm, or a god—but fundamentally, they all represent this same anxiety that the entire world is a trap just waiting to be sprung. These forces are invincible, offering no cathartic boss fights or other victories. And they are implacable, so in games with a narrative or dialogue focus, they can’t be pleaded or reasoned with. They’re also all in some way historic, vengeful remnants of the past lashing out at the heroes’ youth and vitality. These games’ antagonistic forces demonstrate these properties in different proportions, but they’re all always there. The monstrous wendigo of Until Dawn is characterized primarily by its invincibility. Its skin is bulletproof, and it can reincarnate if it’s killed, but it’s also a link to the characters’ pasts, a manifestation of their guilt over a fatal prank they pulled prior to the game’s events. The apocalyptic storm in Life Is Strange demonstrates how these forces are pitiless and unreasonable—you can’t fight or talk your way out of a tornado. That game’s time-bending heroine can either unmake the storm by rewriting history or allow it to pass over her and hope to endure it, but both options come at steep personal costs. The wendigo and the storm are also both presented as punishments ferociously out of proportion to their offenses; in both cases, the characters are led to believe they brought these horrors on themselves. Why are the new youth-culture games so bleak? Over the last decade or so, several large, ominous chickens have threatened to come home to roost, and today’s comparatively politically savvy young adults recognize that big problems without obvious solutions are one day going to impact them far more than the established generations before them. The economy is unsteady for reasons that are difficult to explain, the environment is worsening and important people are refusing to believe the science, and internet mob-driven far-right nationalism is waxing. These problems don’t lend themselves well to singular antagonists whose faces getting smashed would solve everything. Plus, those same unthreatened older adults are preemptively acquitting themselves of wrongdoing and placing the blame for all of this on the very kids whose livelihoods are most in danger, claiming the economy is in shambles because millennials don’t eat cereal, or whatever. These kids are on track to inherit a scorched Earth, and they’re being primed to believe it’s their fault it’s already in ruins. For a generation who spent their formative years fording the housing-market collapse, who are now being told they’re an economic burden for not buying houses, how can the world seem any other way but horrifying and absurd? The institutions that supported their parents and grandparents are obviously dying, but kids are still being expected to participate in them. This is why the ghosts of Oxenfree are Atomic Age denizens, manifestations of an era popularly depicted as the apex of American economic well-being, and why their goal is to steal the young protagonists’ bodies, extending the life of the obsolete systems they represent at the expense of the next generation’s livelihoods. It’s also why the villains of the latest entry in the canon, Night In The Woods, are a cult of Rust Belt ex-miners motivated by a desire to restore prosperity to an irretrievably dead industry. Instead of voting Republican, they sacrifice children to Satan, as if there’s any difference. A few days after the 2016 American presidential election, a young Democratic National Committee staffer encapsulated the impending woes of his generation while venting his frustrations with the party’s higher-ups, lamenting that “you and your friends will die of old age and I’m going to die from climate change.” A wave is about to crash on the upcoming generation, and there’s precious little they can do now to prevent or avoid it; all they can do is learn to cope with it, partly through stories in which young folks successfully endure impossible trials. That’s the secret seed of hope at the heart of this new young-adult game canon: survival. Today’s young heroes no longer save the day or defeat evil, and they don’t complete their ordeals without suffering incalculable loss or making impossible sacrifices. But when the storm passes and dawn arrives, they can still be alive, they still have a future, and the world—though a little worse for wear—is still waiting for them.